After our success at the Extreme Break-Up Adventure Race in Kansas, Andrei and I have been planning on doing another race together in 2012. However, I took 3 months away from AR to prepare for Ironman Coeur d'Alene, and July looked like the first chance we would get to race. Fortunately, Andrei's home club MNOC hosts an 8hr AR near Minneapolis with a reputation for tough navigation and great terrain. Even though it's a super long drive for me, I thought I could work in some family visit time (my parents and grandparents are in Duluth, and more relatives are in Cedar Rapids) on the way. He rustled up some teammates and soon enough we had a committed, 4-person coed team! The maps waiting for teams to pick them up. My drive up to Minnesota is pretty uneventful, I load my bike in the backseat and hit the road alllll day. About 5:30p I roll into my host Erin's house in Afton, and I'm psyched to get to stay there; her house is lovely and quiet and has awesome people and dogs living in it! Andrei comes over soon after I arrive and gifts me a coveted MNOC buff, so nice! 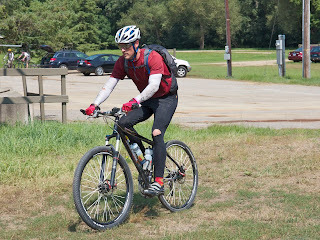 We drive over to Afton State Park to check out the bike drop location and the ski hill - it looks intimidating! Hopefully we will not have to bike straight up. After we get back to Erin's, we chow down on some delicious pre-race pizza (my tradition) and hang out until Jason and Andrea arrive. Meeting them is surreal. I've read articles (and magazine covers!) about their Primal Quest success with WEDALI, heard about them through the AR grapevine, and now I'm lucky enough to race with one of them tomorrow! Jason is on our team, gearjunkie.com, and Andrea is racing as a last-minute sub on GearJunkie/WEDALI who we will probably be chasing all day. I won't get to meet Dave, our fourth teammate, until tomorrow morning but I know he's raced with WEDALI before too, claiming victory at a past Berryman Adventure. I'm pretty stoked about this team. As Andrei wrote in a pre-race email, "its also gonna be fast race...so stay on y toes :)". 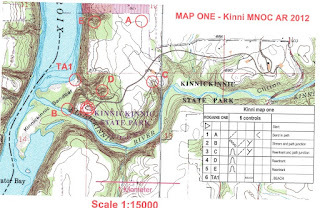 Race morning is pretty basic - my gear is already sorted so I just eat my usual breakfast and coffee and we drive over to Afton State Park for the bike drop and then Kinnickinnic State Park for the Race HQ. We park right next to GearJunkie/WEDALI so get to joke back and forth with them in the time before the race. I also get to say hello to other MNOC members that I know from last year's Possum Trot and meet a few new friends as well! Pretty soon it's time to line up behind the maps and get this party started. At 8:50am, Tom allows the teams to pick up their map packet and get to work on planning routes. 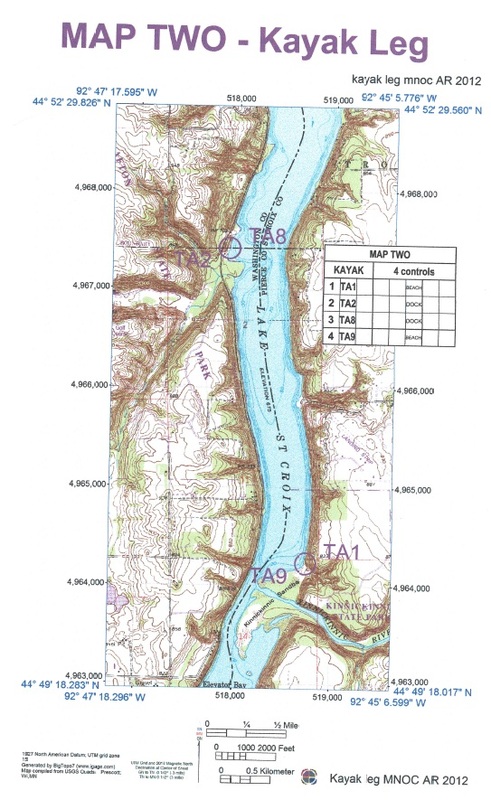 We learn there are 6 maps and a 2-page long cluesheet...lots of information for an 8hr race! Quick thinking will be a key to success today. We grab a picnic table and get to work planning routes. We get through the first three maps only before Tom shouts "GO!" We abandon route planning and take off, fully loaded with packs, PFDs, and paddles on a short out-n-back to grab checkpoint B. I'm a little nervous that we haven't even looked at navigation on the largest trekking section, but I'm trusting Andrei to handle everything. The trail to B is steep, rocky, and slippery from the humidity, and trying to make it down in one piece while carrying paddles is difficult. I am on punchcard duty today so once we gain sight of the kite, I hand off my paddles to Andrei and scramble the last few feet to get the punch. 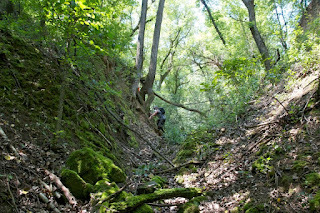 Then we climb back up the gnarly trail in pursuit of checkpoint D. We have to run through a few patches of stinging nettles here and it won't be the last time for the race. Running through nettles isn't physically hard, but it requires mental strength to convince yourself that the stinging is trivial and I focus hard on making it through this section quickly. Andrei leads us cleanly to D, I punch, and then we are off on a more open route using roads and trails to C and A. The day is already warm but I am almost thankful for the heatwave we've had in St. Louis because the temperature doesn't seem to be bothering me. We even have some cloud cover from time to time. This is great! We punch E and then run parallel to the bluff until it's time to descend down to the put-in. We punch TA1 in first place and start assembling paddles and selecting boats. Today I am using a borrowed Epic Active Touring 4-Piece Carbon Paddle from my friend Brian at Epic Machinery. I hop in one boat with Dave, and Andrei and Jason are in the other. There are no checkpoints to punch on the paddling leg, just getting from one state to another. It's soon clear that I am not the best paddler; Andrei and Jason have to wait for my boat several times. But I know I will only get slower if I stop and pout so I just keep making paddle-like-motions with my arms and pretty soon we are at the take-out. The punch is on the top of a flight of stairs so I jump out to take care of that quickly. When I turn around, I see an amazing sight - the boys have stacked both boats on top of each other and are carrying them UP the stairs to where I'm standing. Studs. We confirm with the volunteers that we're in first place and then jog about 1/2 km (7:00 minutes, includes canoe take-out time) on trails to the Afton Alps Chalet, site of this morning's bike drop. Start at TA3, then to CP1, then to CP2, then to TA4 (green highlighter added after the race). 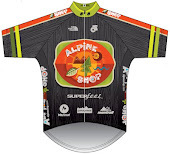 We quickly transition to biking shoes/gloves/helmets and are on the bikes in no time for a long, tough climb out of the Afton Alps Ski Resort. Before the race, Jason warned us that he is still recovering from a serious bike crash last year. In the middle of the hill, he asks Dave for a tow. Dave replies that he is pretty maxed out, so I ride up next to Jason to try and keep him company in the suffering of climbing. Instead of chatting, he gives me a huge push, so much that I almost catch up with Dave. I know for certain that I'm racing with top-notch teammates...even when they are hurting they are finding ways to make the team faster. This is the heart of adventure racing and I feel honored to experience it. The race director, Tom, seems determined to make his racers hurt since he has placed the biking checkpoints on this leg to maximize climb. Our second point is underneath a bridge at the bottom of a large hill, so we fly down, punch, and then turn right around and climb back up the thing. Then we have some more paved rollers that take us to our next TA. Short little trek in the middle of biking. We spot this manned TA on the side of the road, and ride into the ditch to drop our bikes. The trek is short, but we decide to still change shoes and we are out in a flash, still in first place and without seeing any other teams. Andrei navigates everything cleanly (a theme for the day). We see a few other teams who have chosen different routes (including The Beautiful People doing the trek in their bike shoes!) but when we return to our bikes, we are still in first. After a quick transition, it's back onto the bikes and back to the Afton Alps Chalet. As we are climbing back up the rollers, 2 cyclists pass me and Andrei. They are fast. My heart flips into my throat, scarcely believing that we are getting passed at this speed. But as the cyclists come fully into view, it's clear that they are not adventure racers. In fact, they are on road bikes, out for a training ride. No wonder they are so fast. My heart settles down and we proceed to the Chalet. As we descend back into the ski area, we see lots of teams still on their way up to CP1. Some of them are walking up the monster hill. We try to encourage them, but I know it's disheartening to be in that situation (I've been there...paddle leg at Mission 2010 when, ironically, it was WEDALI passing us on an out-and-back and giving the same encouragement). Afton Alps mtb map. This was really tough to nav on. Now, it's time for the part of the race I've been looking forward to the most: singletrack! I've worked hard on my technical mountain bike skills in the last 2 weeks and I'm eager to put them to the test. And turns out the trails in Afton State Park are known for being tough, both technically and physically - they weave in and out of ski runs, interspersing rocky woodsy sections with exposed steep climbs. Bring it on! But first we take time in TA to pose for photographs - I think everyone is a little nervous about the upcoming section so we dally longer than we should. And as we roll out, GearJunkie/WEDALI (Justin, Erl, Andrea, and Stephen) rolls in, lighting a fire under our wheels! Unfortunately, we take that fire and shoot straight up the ski hill when the trail we need is actually along the base of the run, whoops. A quick turnaround, fast descent, and now we are riding behind GearJunkie/WEDALI for the first time all day. Yup, we're in the middle of a race, jus chillin. This section is tough. Not only are the trails challenging, it's hard to match the map up to what's happening in the real world. We stop several times for team map-looking sessions to try and figure out where we are. We are riding well as a team, everyone is handling the techy stuff, but there is just no flow to the mandatory route. The only comforting fact is as often as we are stopping, we see GearJunkie/WEDALI stopping at similar intervals. I'm not sure if it's for nav issues or the heat, but either way, I'm glad we're not losing too much ground. Speaking of the heat, it really starts to hit us during this section. Jason has been excellent about keeping us on top of our electrolyte consumption, but we are still struggling with the rising heat index. My body is handling it okay (guess riding on 105F days got me acclimated) but I know it will continue to be an issue for the rest of the race. Uh, guys? See that other team? They're going the other way. Can someone check the maps? On our last checkpoint in the section, we make our first major nav error. The trails aren't lining up like they should and we blow past the entrance to a side trail we need. Trouble is, these trails are uni-directional, so we can't just turn around and backtrack. We have to repeat about a 1 mile loop to get back to the correct junction. GearJunkie/WEDALI made the same mistake right in front of us, so we make an 8-person choo choo train to reride the tricky loop. Finally, we punch checkpoint N, and roll back to the Chalet to drop our bikes and set out on the longest section of the course. Looks like it's going to be a two-team horserace to the finish line. The biggest trek of the race. We take a few extra minutes in transition to refill water, eat endurolytes, and dunk our heads under the spigot before leaving on this scorcher of a section. We make a loose plan to swap packs as needed and for the first part it's Andrei and I with the extra loads. My left ITB is very sore, it's the same problem I had in the Ironman marathon and I'm angry it's flared up again. I'd already taken some ibuprofen on the bike leg, and I know there's nothing else me or my teammates can do about it, so I just focus on running. My stomach isn't feeling all that great either which is unusual for me, but again I can only focus on keeping hydrated and I choose to stick with liquid/gel calories from here on out. Problem is, I mindlessly left about 200 calories of CarboRocket and 300 calories of LiquidShot back on my bike, so I'm a little low in that department. I have some water left in my bladder, and 1 flask of LiquidShot, but I'm going to have to rely on my teammates to get through this section. This is not me, but it's checkpoint R. I had to wedge myself in those roots to get hands free to punch. 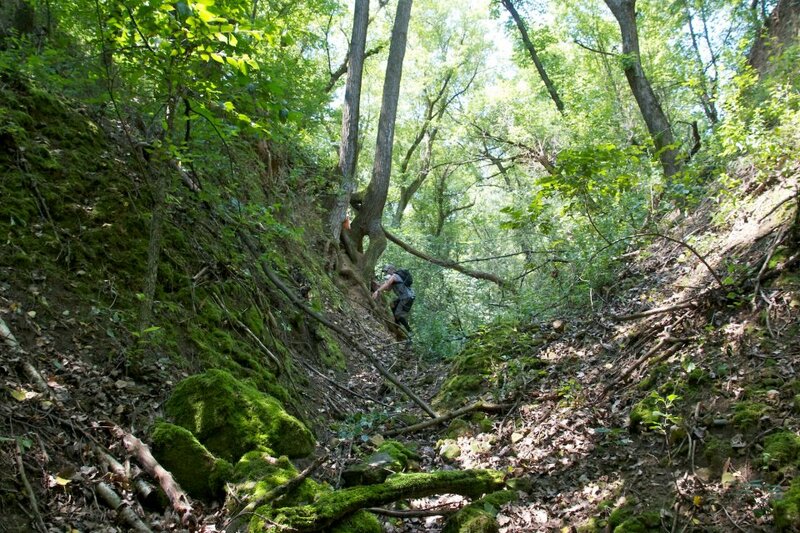 I'm still handling punching duties, and the third checkpoint (R) in is one of the more fun placements I've seen - perched on a earthen bank where we have to climb up tree roots to access the punch. Fun! Every hill, cliff, bank, ledge that we have to cross, and there are lots, we are helping each other at the top with final holds and encouraging words. As we make our way around the loop, it's clear we are all struggling except Andrei. I run out of water, he finds 500mL of Powerade in his pack for me to consume. He carries packs. He takes the punchcard on a few steep checkpoints. And, he's keeping the navigation exceedingly clean and direct. Good job, Space Monkey! Finally, finally, we reach the beach where our canoes are waiting to be paddled back to Wisconsin. We are all running a bit ragged here - the heat is getting to us. But, somehow, we still have the lead. The beach has a public water spigot so we refill bottles and bladders and my mind is put at ease now that I can rely on my own hydration again. 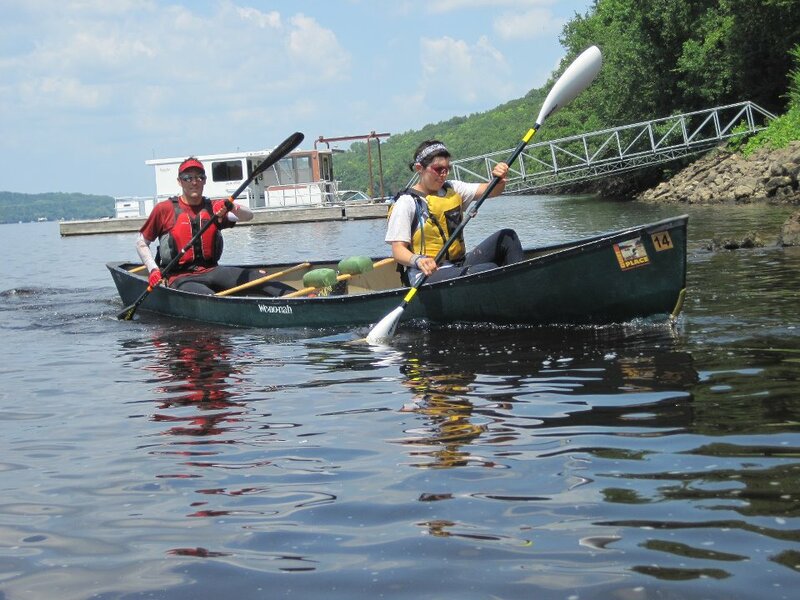 Jason and I paddling into Kinnickinnic Beach. We all dunk ourselves in the St. Croix River before getting into the canoes. This time we've switched paddling partners and I'm with Jason in an attempt to equalize our team speed. Nice try, boys, but my paddling skills haven't improved much in the last 3ish hours. Good thing my paddle looks so awesome! We As we get going on the water, we glance back and GearJunkie/WEDALI is just putting in only a few minutes back...just like Carrie Sona told me before the race, as hard as it is to get a lead over GJ/W, it's even harder to keep it. They do not give up. So we must not give up either, and I put my head down, and paddle as fast as my inexperienced self knows how. Cleaning my shoes after we finished cleaning the boats. We beach the canoes at the take out and then I get to experience my first 10-minute mandatory canoe cleaning. I learn it's common in Minnesota races for the director to require each team to clean the mud/crud from their boat(s), making it easy for the rental group to pick up clean equipment. 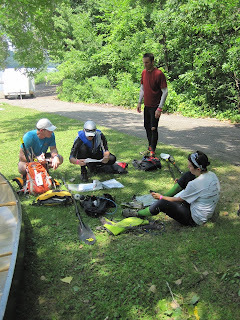 Of course it doesn't take all 10 minutes to wipe them down, so after we're done we spend the extra time resting in the shade, organizing maps for the final third of the race. GJ/W is also in their boat cleaning hold and we are simultaneously encouraging and heckling each other. I take some time to dump dirt out of my shoes and make sure socks are on straight. We are released 1 minute ahead of GJ/W and have a monumental task ahead of us if we want to keep that lead. 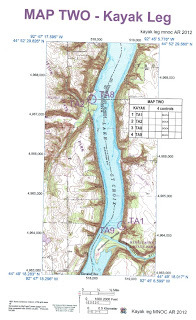 Our first task is to make our way up the massive paved climb from the river to the start/finish line, where we punch the mandatory CP3 and receive instructions for the 2-part mystery challenge. The first part requires our team to spell "GearJunkie" out of things we have on our person. We burst into a flurry of activity and one of the guys has the idea to spell it in nutrition product, namely gel. The race director, Tom, is on hand to officially approve this option so the boys spell "G-E-A-R" with packs and bottles and shirts and I write "J-U-N-K-I-E" with my remaining 400 calories of LiquidShot. Done. The second part of the mystery challenge is some sort of game with a hammer, stump, nail, and Kanye West glasses. I'm not really sure of the rules, but Dave understands it and completes it easily. We are doing these challenges basically side-by-side with GJ/W and I sort of feel sorry for the volunteers - minutes ago they were sitting peacefully in this beautiful state park and now they are overwhelmed with eight intense racers. Thank you, volunteers!! Last mini-rogaine. Checkpoint Z was our only foot nav confusion of the day. We run out of the mystery challenge area and hit this last trekking section. 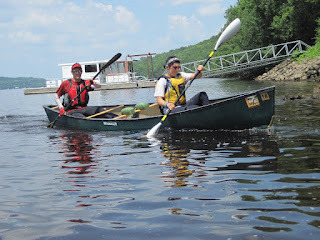 It's still hot, but the paddle and 10-minute rest period had boosted our energy a little bit. We are still swapping packs as needed and constantly looking over our shoulders for signs of GJ/W. There are more patches of stinging nettles to run through. We take exposed trails for some of our route choices, but thankfully a few clouds have rolled in and cover the sun for short periods of time. We run into the first foot nav confusion of the day - Andrei has difficulty with checkpoint Z. It's mapped on a side reentrant and the one we're in is empty. It's not a good feeling. We decide to canvass the area - Jason heads down the main reentrant, Andrei continues up the side reentrant, Dave stays in the middle, and I hike up the main reentrant to check things out. One minute, two minutes go by. Nothing. Suddenly Andrei cries out with "Emily come here" and I am sure he's found it. I'm relieved, but also scared again because as I go up to grab the punch, GJ/W appears in the main reentrant. We have lost the meager time advantage we once had. After punching, I scamper out of there as fast as I can, sprinting though the woods after my teammates. The final two checkpoints are clean and we are running scared as we return back to Race HQ with our completed punchcard. RD Tom inspects the card and I hold my breath, terrified that I've mispunched somewhere along the way. But, he approves everything, and gives us one more set of instructions. We have to take PFDs with us to grab one more checkpoint - the appropriately-coded DD, located in the Devil's Den. To the Devil's Den! It looks so boring on the map, but it's really cool in person. We bust out of Race HQ with one thing on our minds - digging deep. Everyone is tired, everyone is overheating, everyone wants to win. The trek to DD is short, but brutal. 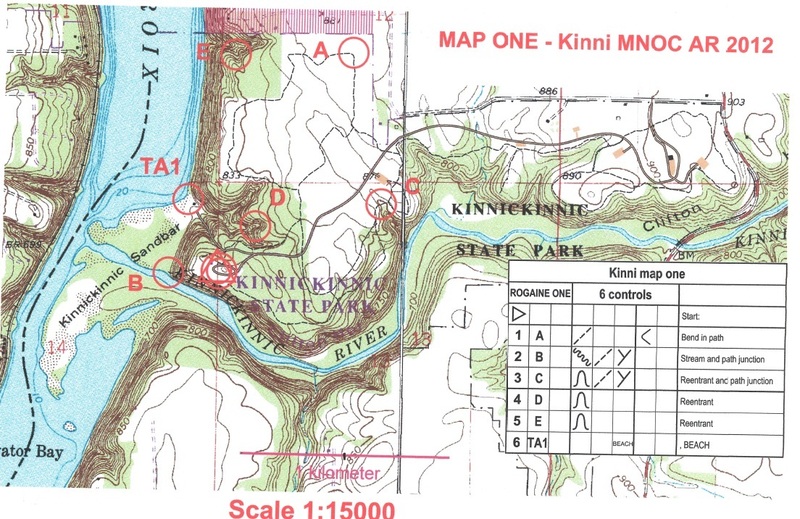 We have to pick our way down a steep, 150' bluff to the Kinnickinnic River and cross the waist-deep, mucky water. The river actually feels great; it's still cold and revives our tired legs. On the opposite bank, there is a large swath of stinging nettles to charge through before we enter the Devil's Den - an intricate shelf-rock reentrant formed by thousands of years of erosion. Andrei is the only one with pep still in his legs so he takes the punchcard ahead for the final punch while Dave, Jason and I carefully pick our way up the slippery rocks. Once we turn around for the return to the Finish line, we see the four white shirts of GJ/W at the entrance to Devil's Den. This is going to be a painful finish - we have to charge back through the stinging nettle, back over the river, and back up the steep bluff in order to claim the win which we all want so badly. We move. Nettles...check. River...so cool and refreshing...check. Bluff...so steep and painful...check. Now all we have left is a 400m trail run to the finish. Except, Jason is getting tunnel vision and needs a tow. So I take his PFD and he holds onto Andrei's two packs and we run. There is a gust of wind and Dave thinks it's GJ/W crashing through the woods ahead of us. Freak out! Once we see the finish, I sprint ahead for the final punch. I turn around and there are no other teams coming behind us. We win! Andrei's GPS track of the entire race. Only 4 minutes after we cross the finish line, GearJunkie/WEDALI comes charging out of the woods for 2nd place. We exchange high fives and congratulations, knowing both teams put in fantastic efforts on the day. Since it's about 3pm and the post-race food won't show up until 4.30pm, we decide to go back down to the St. Croix River to swim a little bit and clean up. The water is very warm but it's fun to bob around with these talented athletes. I resist the urge to swim a few strokes of butterfly and instead just doggie paddle around. Winner winner ice cream dinner! When I get back to HQ, the barbeque has been delivered and it's delicious. I have second helpings of mashed potatoes with bbq sauce, and 2 cans of heavenly nectar coke. My phone service is a little spotty but I manage to make contact with my grandparents who tell me they will be arriving at the park shortly. I haven't seen them since...I don't know...February?...so it's wonderful to give them big hugs, tell them all the stories from the day's race, and have them take pictures at the awards ceremony. I select a Columbia bug jacket from the prizes since it's something I don't have, and I also win a Platypus water bottle from the raffle! Score! After the awards ceremony, most everyone packs up and goes home. Andrei and I return to Erin's house, along with Peter, and we feast on pizza, ice cream (thanks Peter!! ), beer, slacklining (I'm terrible), dog cuddling (I want one), and creek standing (brrrrrr!) until the sun goes down. The next morning I pack everything up and say my goodbyes to Erin and her wonderful house, and start the journey back to Missouri. I stop in Cedar Rapids to hang out with my relatives (and their crazy adorable kids!) for a late lunch and then I'm back in St. Louis as the sun sets. Excellent report. I really appreciate the way you always give such a detailed explanation of your route selection. I did have to laugh a bit when you said the post-race food hadn't arrived yet when you guys finshed. That's a problem Team Virtus has never had to deal with. Thanks Bob! I try to write stuff that I would want to read from other teams. More on that in my next post (in the works). Don't worry, there was plenty of food for everyone, you guys should do this race next year! Also I'm super stoked to read your AP log, you'd better keep it updated! Thanks Kate! Awesome to finally meet you at the O-meet. Nav on! Stinging nettle is trivial.... yes , but it sure does sting. And Platty bottles are the best. Congrats Emily.